You probably have a story like this: I call up to get a price for the replacement piece of glass for the surface of an electric cook-top. $250. The person on the other end of the phone says, you can get a whole new cook-top for $300. How do you look at this? A whole new cook-top for $50, bargain. I get a shiny new thing. An update. An up grade. Its simple. A no-brainer. I’d hate to try and unpack the alternative. Lets unpack the alternative: Get someone else to repair it for more than the cost of a new one. Ok, no one’s going to do that. How ’bout buy the part and save $50. Save the embedded energy & pollution (from manufacture), environmental damage of landfill, transport of materials. Loose the time it takes to repair. Risk the cost of destroying the unit doing an inexperienced repair. 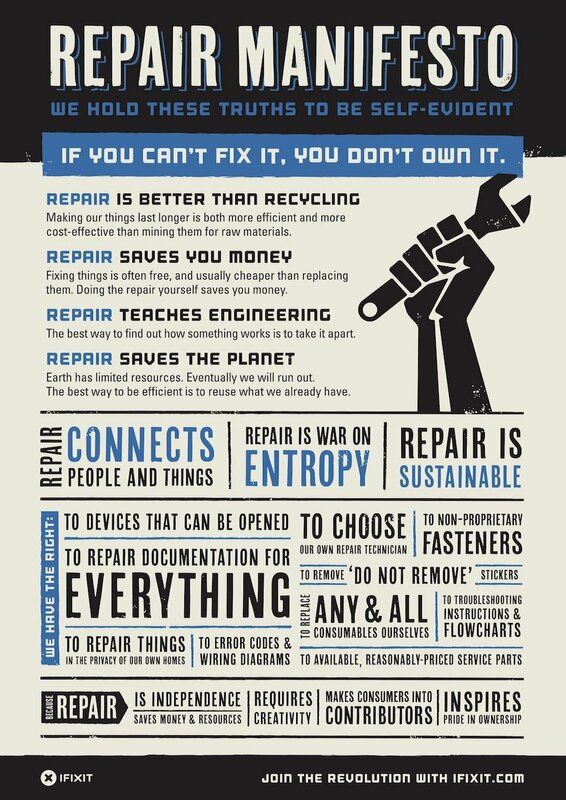 If you ignore the externalised cost on the planet, it definitely seems easier to replace rather than repair. You can only do that if you’ve convinced yourself that your life is to busy and important to waste the little bit of time that it’s going to take you to do some googling, introduce your self to your neighbour and borrow a screwdriver. It’s easier to pay- rent or rates- for some one to come and pick up your junk and drive it around the corner and dump it on a frog than to face the fear of learning a new skill and potentially failing at your first attempt. But that was the old you. The new you will have a crack at anything, especially with these handy hits. Have a look. Don’t know how to fix it? Then where did you get stuck? What did you try? What isn’t it doing? Make sure you have question to ask. Ask someone else. Next door neighbour, Facebook, people on the street. Ask them to explain the process they went through to fault find (look, listen, smell, what happened when it stopped?). A power supply is the unit that takes the power from the wall and converts it into the correct voltage for use in the appliance. Are there lights on? where are the lights? Electricity can kill you. So unplug your appliance before you go poking around. Appliances with capacitors (the things that look like batteries on the circuit boards) like TVs can retain a charge for a while, so let them discharge for an hour an don’t go plugging anything in while the case is off and be wary of kids touching. Can’t see or hear electricity! Repair manuals exist for most things. You might have to buy it… digitally. Sell it when you’re done. There may be a number list of faults called error codes. The appliance may be trying to communicate one of these numbers to you via a blinking light or something more puzzling. Take photos if you’re scared you won’t be able to put it back together. Google it, youtube it. Stop watching netflix for 5 minutes and read up on it. Shirts got a hole in it? Patch it up with contrasting material and thread to announce to the world that you used to think that new adidas shirts were fancy, but now, whatever you already have and have fixed, is fancier. But what about the economy? Never mind that. We can talk about the economy when we’re on a rocket hurtling away from this fucked up planet. Scratch that, you can talk about the economy, on the rocket with your selfish buddies while I’m down here helping old mate figure out how to print through linux.